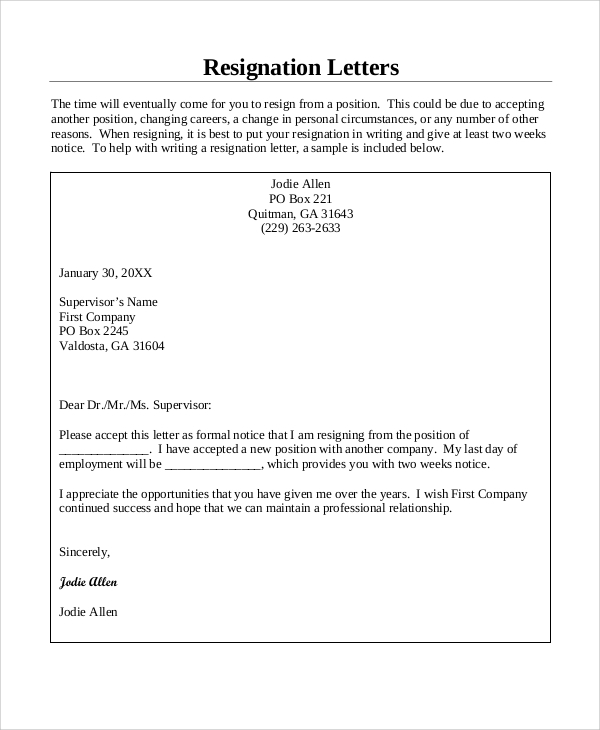 Every employee needs resignation letters at some point in their professional career because everyone has to switch from one company to another for better opportunities. The following resignation letter samples cater to various categories of resignation letters such as resignation with a notice period, with a reason, teacher’s resignation letters, and general job resignation letters as well. 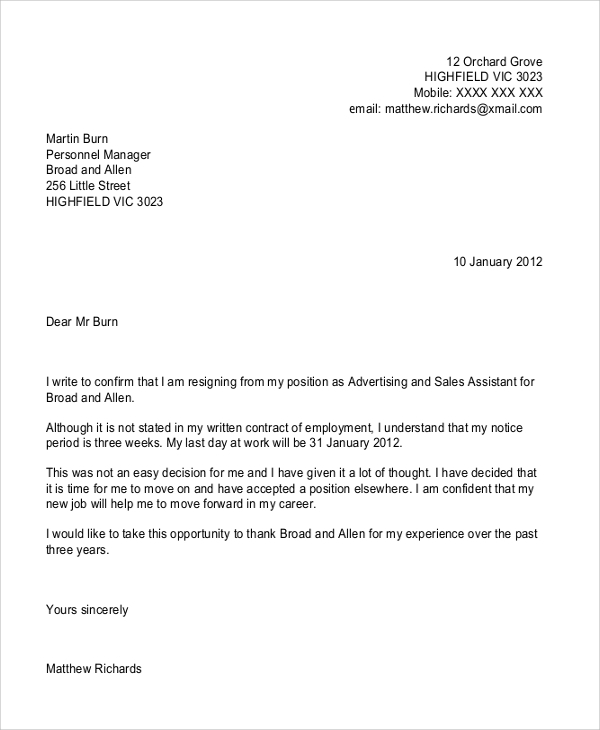 There are guidelines to be followed while writing a proper and Professional Resignation Letter with appropriate words. 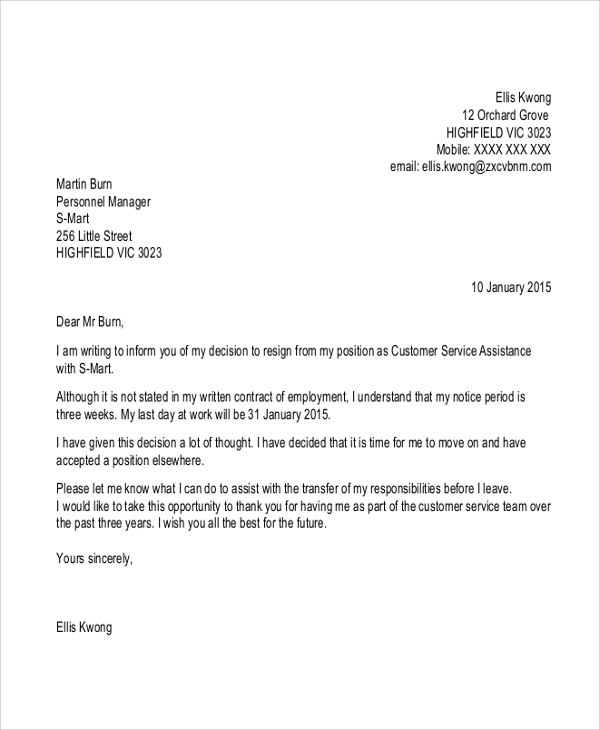 This is a sample resignation letter with a short notice period. It is brief and contains positive sentences only. It is written with the help of thoughtful words and with a proper explanation for the resignation and mentions the notice period clearly. This is a general resignation letter with a brief and to the point writing. With the help of this sample, an employee can state the reason for his/her resignation and mention the date from which his/her resignation will be effective. It is a chance for thanking the company and the associated managers. This is a proper format for a professional resignation letter with reasons. It is a formal notice, and it can be used as a legal document in future if a conflict arises. It is brief and to the point letter, and it clearly states the reason for resignation. 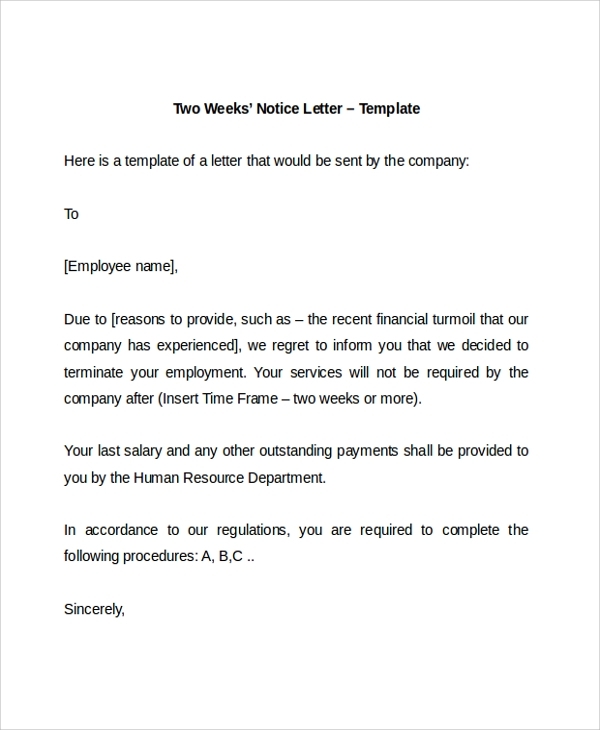 This is a sample resignation letter whereby a company terminates the employment with two week notice period for its employees citing the proper reasons. On the other hand, an employee can also use the same to send his/her resignation to serve a two weeks notice period. 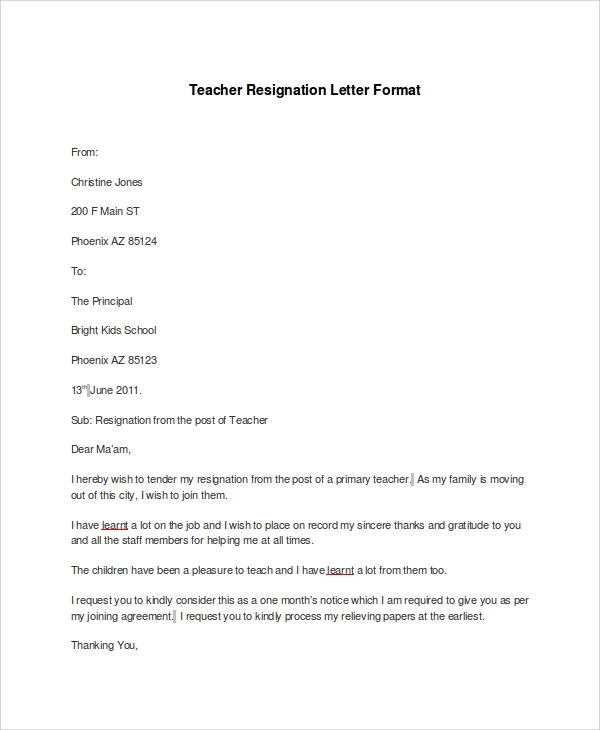 This is a sample teacher resignation letter, and it is addressed to the principal of the institution. The teacher wishes to resign citing the proper reason for the action. It also mentions the notice period and a sweet thank you note. At some point or the other, everyone has to resign from one company to move to the other for better opportunities. While leaving the company, it is mandatory to send a written resignation letter which could be stored as a legal document. 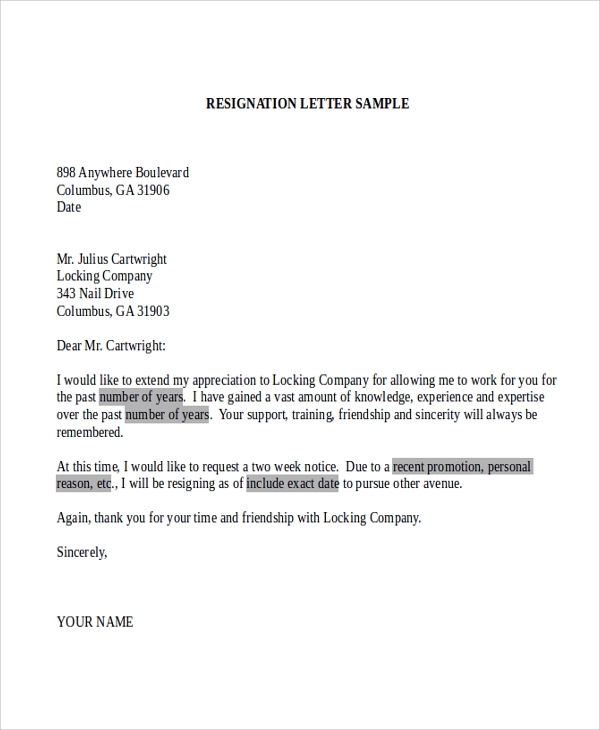 The above-mentioned resignation letter samples provide the proper format and template to write a professional resignation letter that gets accepted all the time. They have different templates to cater to all the needs such as resignation letter with a notice period and with proper reasons. It makes sure that you leave the company on a positive note to get a reference in future from your employer. The targeted audiences for such resignation letter samples are the employees. Such samples are also useful for the companies when they want to terminate the employment of a group of employees or a particular employee. Such letter samples have the template in correct order, and they are brief and decisive. It shows how to write the letter with brief, polite sentences and how to write a thank you note for the same. Five different formats of Resignation Letter Samples are provided above to cater to the various categories of resignation letter requirements. 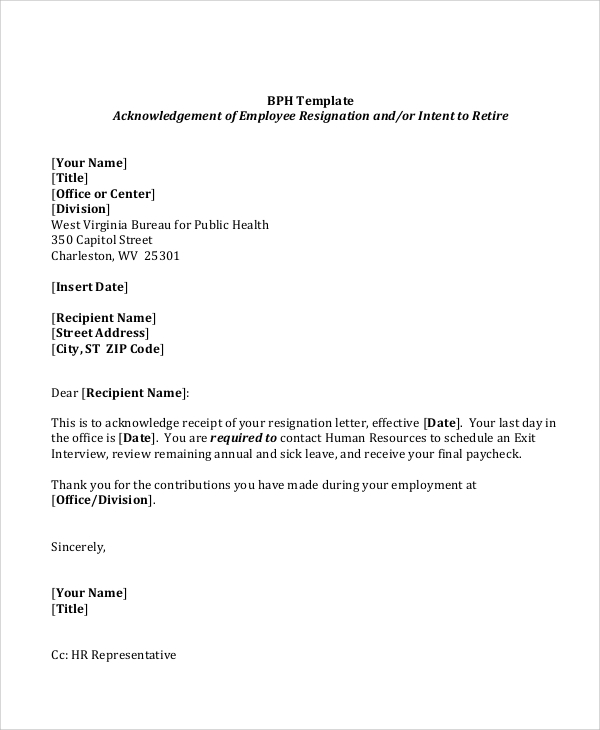 They have the proper format and sample to show the needy about how to write a polite and professional resignation letter that gets accepted as a legal document. 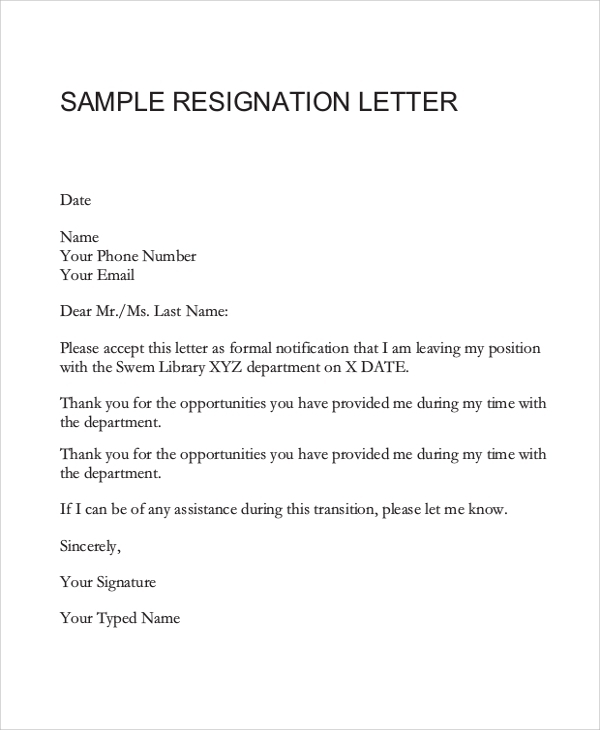 The above resignation letter templates are fully editable, and with only a few minor modifications, one can dispatch it to start the notice period as soon as possible.